On the 1st of April 1918, the University of Cape Town was founded. Set in incomparable surroundings on part of the Groote Schuur Estate, this centre of higher learning whose full title is the University of Cape Town with which is incorporated the South African College, can trace its ancestry back to 1829 when, on the 1st of October of that year, the College was founded as a private venture by a body of citizens who contributed to its establishment through the purchase of £10 shares. 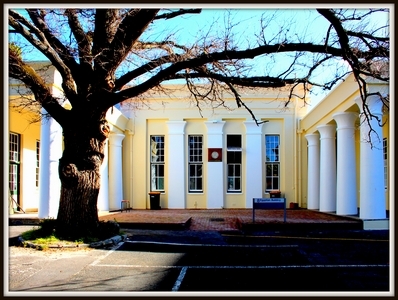 In 1841 the College moved from the rented rooms, which it had occupied in the orphanage at the top of Long Street to its own premises, the first building in South Africa erected for university purposes, at the top of Government Avenue. Known as the Egyptian Building, it is still in use today. Until 1874 the College functioned as a combined primary and secondary school, which catered also for a handful of students at university level. In that year, however, the lower classes were separated from the College itself and formed into the South African School. 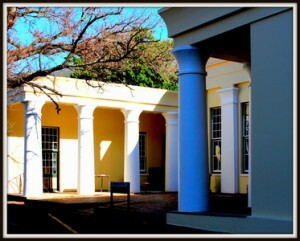 In 1910 the College took over the university classes, which previously had been held at the Diocesan College, Rondebosch, and six years later the Cape Town Normal College amalgamated with the South African College. Then the University of Cape Town, with which is incorporated the South African College, was incorporated in terms of Act No.16 of 1916. The University was opened officially on the 1st of April 1918. Erected on the Groote Schuur Estate.